Have you ever read an article, listened to a podcast or heard a speech that motivated you to perform some kind of action - only to realize that action was really difficult to accomplish? Well, that's kinda what's been going on for many people who try to implement a badge system or even something as basic as attempt to issue a badge to a single person. Often times, people are so inspired by the movement of badges that they take the next step and attempt to do something in their community to make badging real. This is fantastic - because Open Badges is both a social and technological movement. However, if the barrier to entry is so high - then we are making it difficult for those movers and shakers to, well you know, move. This common user experience helped us to identify an opportunity to design tools that make it easy as pie to dive into badging. The response to this is what we are calling BadgeKit. We are even making these postcards to announce this. 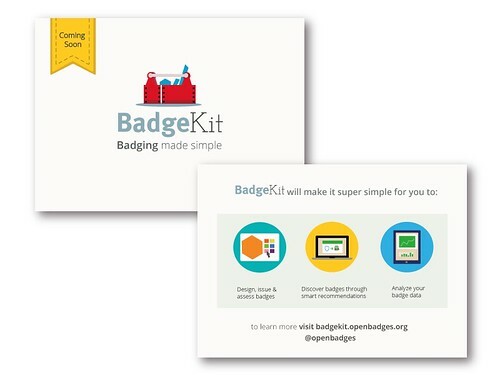 BadgeKit will not only make it simple to get started with badging, but it also will provide lightweight, modular and open options for the community of badgemakers. So now that I have your curiosity, I want to gain your attention. We are framing badgekit around a set of action verbs. Each verb represents an invitation to innovation around defining and refining the user experience for the particular action that the user is attempting to do. Here are the verbs: Build, Assess, Issue, Collect, Share, Discover and Use. You can read what Sunny Lee wrote more about the verbs here. BadgeKit evolved out of several years of work in this field as well as LOTS of user testing and research. Our initial goal will be to develop proofs of concept for experiences for each of the actions. In order to develop a vision for this work, I looked at the work that we have been doing for the Chicago Summer of Learning, the Connected Educators Month and for the Mozilla Summit. Each project helped us to produce some great open source solutions for distinct badging experience ranging in size from one badge to thousands of badges being issued. 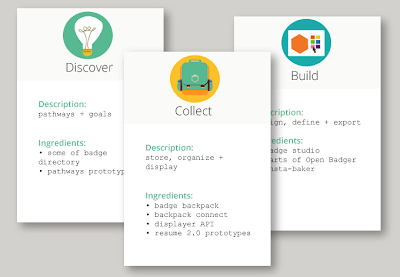 With each project, we user tested, got feedback and iterated - so just think of BadgeKit as our next big iteration on our offering. 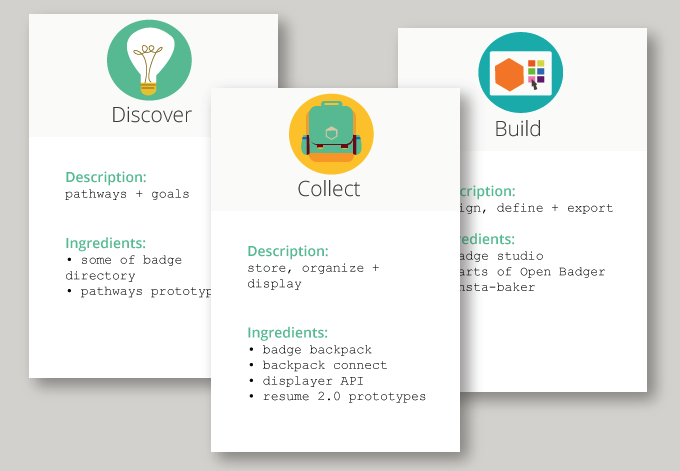 If you are familiar with the tools that we currently offer through openbadges.org - it might be easier for you to digest this information through recipes. So now you know - what we are building and a little bit of why - but let me tell you a bit about how we are building it. 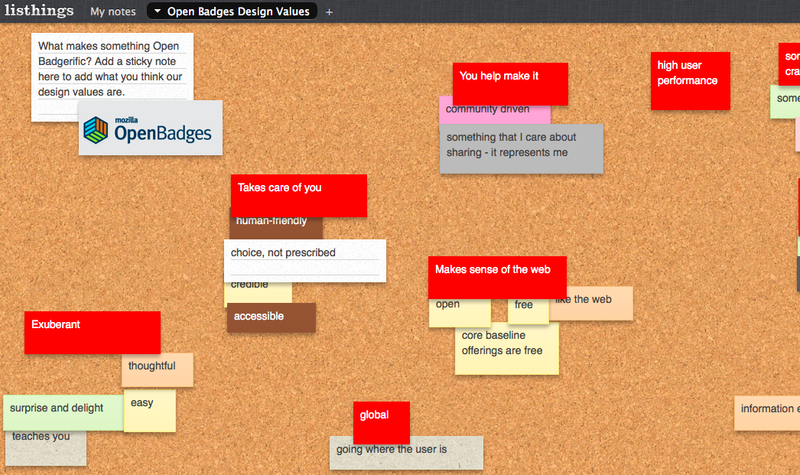 As a team of Mozilla and community designers, developers and people who have tried spinning up our own instance of badges - we have been trying to find our voice. Specifically, we asked ourselves "What makes something Badgeriffic?" Over the years we've had a hunch about what the answer is and over the past few weeks, I've done a bunch of initial exercises to help us to start to identify what our design values are. Even as I write this post, I don't have a definitive answer, but I am going to share with you our current thinking and ask you to give me some feedback and thoughts about what you value. 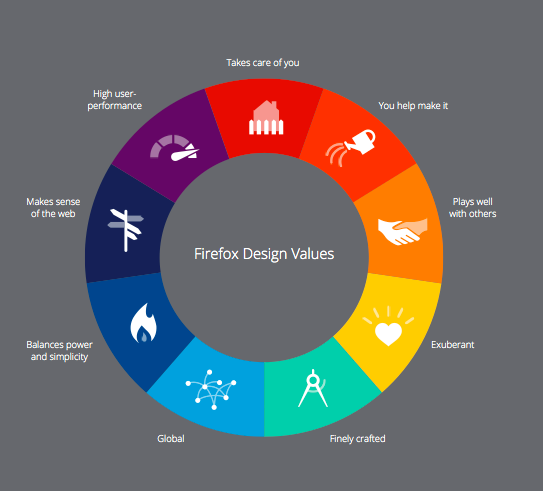 This makes sense because well, we are one Mozilla - and behind all of our work we have that heart connection that motivates us to work for a non-profit and we want to build things that make the web better. On a high level, the BadgeKit offering will help to shape environments, build products, empower communities as well as teach and learn: the four pillars of our work at Mozilla that our Chief Lizard Wrangler Mitchell Baker recently presented at the Mozilla Summit. In the next few weeks there will be an announcement about this work and we will be working on the action verbs proof of concept. In the meantime, I would like your help: what do you value and what makes something "Badgeriffic" to you?